According to Ayurveda, as the temperatures rise, the qualities of Pitta dosha (sharp, hot, penetrating) increase in our physiology. One might assume that that our digestive fire (or “agni”) would also become stronger. But in fact, in an attempt to regulate body temperature, our phyiology does its best to dispense heat and lower its own internal heating mechanisms. As a result, our ability to digest food actually diminishes. This is why we often feel less hungry and want to eat less during the summer months. It is important at this time to follow the body’s impulse to eat lighter and smaller meals. Increase sweet, bitter, and astringent tasting foods that are light in nature. Eat plenty of bitter salad greens. Lettuce, arugula, radicchio, basil, and endive are particularly Pitta balancing. Include cool drinks and raw foods in the diet, including cucumber, mango and coconut water. Natural fruit juices without added sugar, mint teas, and raw berries are good choices. Favor: coconut water, watermelon, cilantro, leafy greens, okra, zucchini, asparagus, olive oil, sunflower oil, coconut oil, ghee, cucumber, soaked/peeled almonds, kale, broccoli, pomegranate, apples, cranberry, mint, dill, fennel, cardamom, coriander, saffron. Avoid: tomatoes, eggplant, chili peppers, garlic, dry ginger, black pepper, fermented foods, spicy foods, sour fruits, heavy protein, mustard oil, molasses, coffee, alcohol. Be sure to drink plenty of water to offset the drying and heating nature of Pitta. Add fresh mint or lime to your water. Cooling herbal teas such as peppermint, licorice, fennel or rose, taken at room temperature, can be extremely refreshing. Avoid iced drinks. While it is important to keep cool in the summer it is more important to keep our digestion strong. Room temperature liquids will be assimilated into your body more quickly and they will not extinguish your digestive fire. Remember that incompletely digested foods create toxins and impurities that are eventually absorbed, travel throughout the body, localize in the tissues and disrupt their functioning. This process can play a major role in wide variety of chronic conditions, including insomnia, chronic fatigue, arthritis and heart disease. Blanch peaches in boiling water. Remove skins. Blend raspberries and strawberries together with sugar or honey to taste. Spoon the berry mix over the poached peaches. Serve with a garnish of mint leaf. 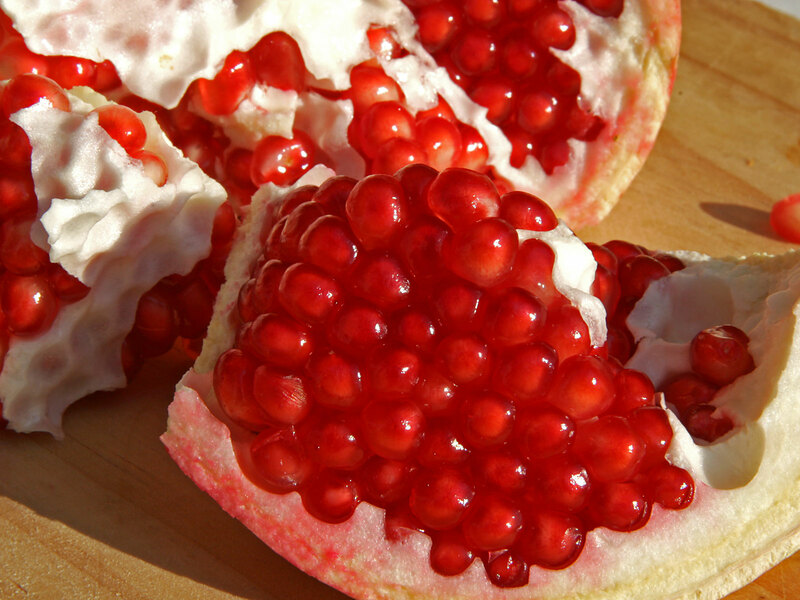 ( Picture of the pomegranate. Source: Google Advance Image Search. This entry was posted in diet tips, Pitta Tips and tagged Ayurveda Digestion, Ayurveda honey, Ayurveda Summer Tips, heated honey, Pitta diet, poor digestion, summer diet, summer digestion, summer tips by The Raj blog. Bookmark the permalink.